This category contains the Speedflow 400 series Push On Hose Ends that are manufactured by Speedflow to precise AN dimensions. 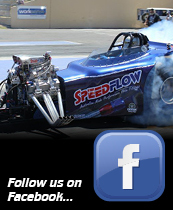 Speedflow pioneered the compact swept elbow design many years ago. It remains one of the strongest angled hose ends you can buy. Our push on hose ends will fit any compatible AN hose. We highly recommend Aeroquip AN push on hose. This is the only type of push on hose we retail because of the high quality, durability and longevity of life. You can view all our hose types in the Speedflow Hoses category. Our AN Push On Hose Ends are machined from marine quality 6061 aluminium. 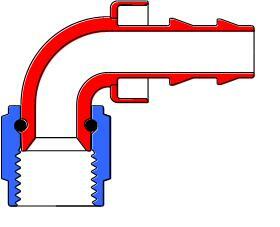 As standard the 400 series AN Hose Ends are finished in a read and blue anodised finish. We can have these finished in any colour, you can read more about our Custom Anodising service here. Most sizes and angle now available in Black from stock. Speedflow pioneered the development and manufacture of the compact swept AN hose end. It is one piece from seat to hose insert. All popular sizes and styles of our AN Push On Hose Ends benefit from this design. Want Your AN Push On Hose Ends Fitted? We do not and never have charged for fitting hose ends on to hose. The only qualifying factor is that you purchase the hose ends and hose directly from us. 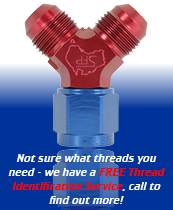 If you want us to fit your hose ends as part of your order please call us on 01934 864310 or send an email. We will assemble your hoses at no additional cost and often without delaying the despatch of your order.